I’m about to go vote, because the alternative is just too horrible. When I vote with my dollars in tomorrow’s ComicList election, the big winner is likely to be Viz. In the interest of full disclosure, I’d pick up a new Furuya series no matter how it was described, but this one sounds fun. This entry was posted on Tuesday, November 2nd, 2010 at 7:08 am and is filed under ComicList, Viz. You can follow any responses to this entry through the RSS 2.0 feed. Both comments and pings are currently closed. I might give Kimi ni Todoke: From Me to You, Vol. 6 a read but volume five left me luke warm the first four volumes where fantastic thoguh. Also Lucky Star volume 6 becuese I waited on that one for quite some time. 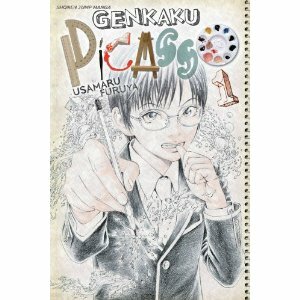 Genkaku Picasso sounds like something that needs to be picked up. Thanks for the heads-up!